The Screaming Pope: When is a Duck a Duck? “If it looks like a duck and quacks like a duck, it’s a duck,” is certainly not tantamount to “the pot calling the kettle black.” “The pot calling the kettle black” signifies a kind of cognitive dissonance, where as the duck homily is basically pointing out that “what you see is what you get.” The duck metaphor is not surprisingly invoked in matters of sexuality. If he or she acts sexually, and dresses sexually (red nail polish has been cited as a sign of lubricity while a bulging crotch conjures both a large and tenacious package), he or she is hot. From a philosophical point of view the duck is like giving Plato the bird. As you may remember Plato believed in ideal forms and compared the human condition to a cave in which dwellers could only see the shadows on the wall. 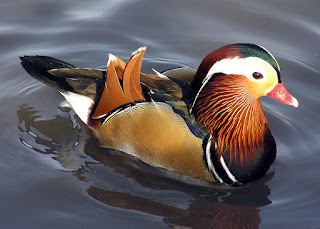 Knowing that a duck is a duck is a product of the senses or phenomenon while stating that the essence of the thing cannot be cognitively ascertained posits the notion of the Kantian noumenon. Aristotle was more of a duck man as he believed that fundamentals of reality were ascertainable through perception. Where does the expression “like water off a duck’s back” stand in this discussion of the nature of reality? Well the meaning of the phrase refers to the idea of imperviousness. For instance you might say that Marco Rubio’s insults fell upon Donald Trump “like water off a duck’s back” meaning that Trump was basically unperturbed by them, (though the same might not be said about the insults of more formidable opponents like Hillary Clinton). Another way to put this is to put a duck out in the rain and sea how the water affects the duck’s back. If raindrops are like Rubio’s insults hitting Trump you can be sure that the duck is a duck and not some other Avian creature.